You helped me save a zebra Danio who was badly injured from a bullying situation. He has healed beautifully and your suggestions on rearranging the tank and reintroducing the Danios solved the bullying problem. One of my Columbian tetras appears to be the victim of fin nipping with accompanying fin rot now setting in. There are two spots visible (see photo). This school usually gets along great although they do chase one another on occasion. I do weekly water changes of 20%. Water parameters are as follows: Zero for ammonia and nitrite. Nitrates around 20 ppm, gH at 7-8°, temp around 76°F, pH 6.8. I run a canister filter with biomedia that includes matrix and chemical filtration is Chemipure green. I also run a sponge filter rated for 20 gallons which is connected to a battery backup air pump (we have frequent power outages where I live). Other tank inhabitants are a school of orange laser Corydoras and MTS (substrate is sand) and Nerite snails. Tank is a 20 gallon planted. I have upped my water changes to 10% every 3 days since I discovered the fin rot. It does not appear to be getting worse and the tetra is active and eating but I don't want it to progress further. I can't use aquarium salt because of the Corys. I do have SeaChem Paraguard on hand that I used to treat my Betta who had fin rot when I purchased him. 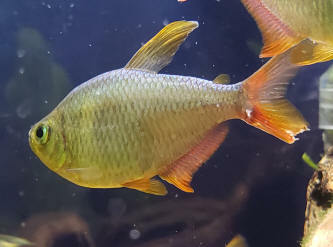 Do you think its advisable to treat the tetra in the tank with Paraguard? I can relocate the Nerites and the larger MTS who are active at night and visible on the substrate. MTS are expensive here and only available online so I would prefer not to kill them off. I can also transfer the tetra to a small hospital tank. I had ordered Kanaplex with the intention of adding it to food with their binder Focus, but I was sent the wrong product so it will be about 5 days until the Kanaplex arrives. The Kanaplex was my backup plan if the water changes didn't help. What is the safest course of action in your expert opinion? I'm moving everyone to a 50 gallon planted tank that has just finished cycling once it was settled in and aged a bit. Hopefully that will solve the territorial problems. I am happy to learn that corys can tolerate salt if I ever have to use it in my tank. I went ahead and removed my snails and I'm treating with Paraguard. I will definitely follow your advice and increase my school of tetras once I've relocated them to the 50 gallon. Hello crew. Hope you are doing alright. Today one of my Congo tetras, the biggest and dominant male appeared with a big swollen and open mouth. His head looks very red and swollen. He is still responding to stimulus but very weakly. His condition is worsening by the hour, so this is a very aggressive ailment. He was not like this yesterday. Other notable symptoms are an under jaw with marked veins, a small blood blotch near the pectoral fins. This looks horrible and I've never seen anything like this. He does fight a lot with a certain other male to the point of pursuing each other across the whole 150 gallon aquarium they are in. I've had my group of Congos for two years now. When i first got them they came with a type of mouth fungus, something that looked like they are white gums and no teeth (its the closest i can to describe it). It never got bad and it went away once happy in my tank. Now all of a sudden this. I checked the other Congos and there is one with the same white gum thing that i saw two years ago, but it is not hindering in normal feeding or behavior. I conducted a large water change (50%). I have quarantined the sick fish into a 5 gal bucket with 1/2 Methylene blue and will be waiting on response. Its 8 pm and i don't think i can go get anything difficult right now and i don't think he will make the night if i don't do something right now. I have malachite green, Metronidazole, and Levamisole in my med box. Any opinions crew? I'd like to thank you once more for your previous advice, last time I wrote about a suspected case of Ich which is now resolved. I've had no more fish deaths since losing the last of the extra rosy barbs that I bought from the LFS, sadly Pinkie succumbed to his saddle ulcer in the end. I had him quarantined for the last week or so of his time, and whatever he had does not seem to have affected the rest of my fish. 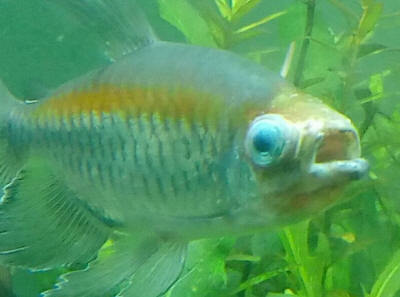 I still see the occasional white or clear stringy droppings from the rosy barbs but I am starting to suspect this is a result of them accidentally ingesting sand then excreting it in mucus as there are plenty of green and brown droppings too and they all seem healthy otherwise. Currently my 30gal tank has one head and tail light tetra, three adult rosy barbs, and all 16 of the barb offspring (ranging from 1cm to 2.5cm). I'm aware that this will be far too many rosy barbs when they grow up so I'm hoping to find a home for them in the big aquarium at work which currently only has a single small fancy (ugly) goldfish. I'm not sure that this will be a compatible mix though since even if 5+ barbs are added to keep them well behaved and not nippy, I think they might dominate at feeding time due to being more able-bodied and they might starve out the goldfish. Thoughts? keep the temperature down. Winters here are mild too. With the threat of ich and Columnaris gone I have bought four more head and tail light tetras to keep my singleton Mr. Beacon company. avoid a known source of diseased fish. When they got here, two of them had white coloured patches on their mouths, and one of them was very sickly, limp and skinny looking. My initial thoughts were that they may have scuffed their mouths against the plastic bag in transit, or gotten feisty with each other since they were all together in the one small bag, and gotten injured while fighting. The bag wasn't a breather bag and the skinny fish did perk up once out of the bag and in quarantine, he hides a bit but his appetite seems okay and his belly is filling out a bit more; he could have been underfed or oxygen starved maybe but I'm a little suspicious that he could have fish TB or some other disease that could cause skinniness. I've treated them with Praziquantel so far just in case they were skinny due to worms. I'm using the tank that the baby fish used to be in, the tetras have been in quarantine for a week now and I think that in two of them the white mark has gotten smaller but noticed today that a third one has a white mouth too. I'm a little worried it could be Columnaris not a wound, or a wound that got infected with Columnaris. and I'm just hoping after another week or two in quarantine nothing will have worsened and I can get them into the bigger tank. Anyway I just don't have the experience to tell whether these white mouthed fish are injured or diseased or both. Hope you can help. I did end up getting a RO/filter system which has a mixer tap and a TDS inline meter allowing adjustment for both drinking water and aquarium water. I still don't quite have my head around converting TDS ppm to general hardness degrees - I did read somewhere that dividing ppm by 10 will loosely approximate French degrees but then I don't know whether French or German degrees are more commonly used. I haven't been, because I thought that it was only necessary to allow time for water treatment chemicals to do their work but is letting water stand useful for other reasons? water be agitated? Or just tipped into buckets? Ok sorry this got to be a lot longer than I originally intended! I really appreciate the time you take with educating new hobbyists like me and reading our rambling emails. than putting them in the community and making them compete with greedy barbs, and I think it would be easier to manage water softness and ph if I start again and do things differently in a new tank. Thanks once again and I hope you have a great day. With regards to the barbs occasional odd dropping, they are fed once daily or twice if I don't have time to watch them in the morning. If I am in a hurry they get a quick pinch of flake and then I take a bit more time in the evening feed to watch how much they are eating. I have some frozen community blocks which contain both meaty and plant materials, I usually give this two to three times a week (slicing off a small amount and feeding little by little trying to avoid over feeding). I have some Spirulina sinking pellets (also contains other ingredients) that I bought for the shrimp but proved to be very popular with the barbs, they will carry the pellets around spitting them out and sucking them up again, gradually working on them until they soften up. I crush some up for the younger fish but they seem to manage okay on full sized pellets, worrying at them until they break into smaller bits. I have some meatier pellets, with a higher protein content but they are not as popular so I don't feed those very often. They get smushed up frozen peas, thawed and peeled, every few days which they love. If I find a patch of snail eggs I will knock it off the glass and the female adult barb in particular loves munching on those. Occasionally I net some mosquito larva from either the pond or the snail tub and these make a popular snack. about it. I was worried at first that they were doing this because I wasn't feeding them enough but they were still doing it when I tried feeding them twice a day which I decided was too much. I think if they like eating fresh plants then they should be allowed to eat fresh plants so I've been growing more Hydrilla in a tank outside for them since that's the one they stripped to bare stems first of all. I don't often see the tetra eat, he hangs back while the barbs feed so I always attempt to get a pinch of flake to his part of the tank. He doesn't like me scrutinising him though and moves front on so that he's hard to see. He does get interested in the frozen food and will test and spit out various particles of it until he finds one that he likes, I'm hoping he gets a bit more confidence once his fellow tetras join him, I've been feeding them a small amount of flake daily and they get quite excited at feeding time so I think in a group his instincts will kick in if he sees a lot of feeding action going on around him. 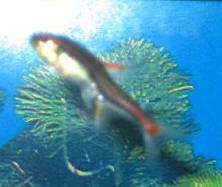 <Tetras are frequently more carnivorous, especially the smaller ones Neons, Penguins, various Hyphessobrycon species and so on. They often enjoy Daphnia and the like. On the other hand, do bear in mind some tetras are much more retiring than Barbs. Put another way, many South American tetras come from blackwater streams with very little productivity. They've evolved to expend as little energy as possible between meals. Barbs typically come from ponds and streams with much more productivity and a lot more for them to eat. They've evolved to be more "busy" and expend their energy in all sorts of foraging and social behaviours. 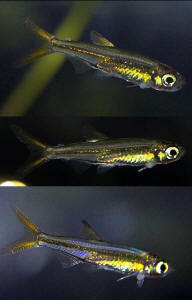 In other words, tetras wait for food to come to them, while barbs seek it out and if necessary push competitors away. Funnily enough, those barbs from blackwater streams (like Pentazona Barbs) are much more like Neons and other tetras in personality. In any event, if you understand the environment the barb or tetra species come from, cohabiting different species from among them will work better. Tiger Barbs are bolshy, so mixing with pushy characins like Black Widows makes sense. Rosy Barbs are subtropical to boot, so you'd choose only low-end tropical tetras for life with them, perhaps Buenos Aires Tetras. I haven't measured my water parameters for a while but for a long time I was getting pH steady at 8 (despite driftwood and almond leafs) ammonia 0, nitrite 0 and nitrate 5-10. I do weekly water changes and fortnightly rinses of the gunk from the filter. I try weekly to vacuum the gravel in the gravelly parts of the tank and skim the surface of the sand in the sandy parts of the tank but I don't know how effective a job I do. I always see gunk being sucked up the tube but everything looks even messier than when I started once I've tipped the new water in. be a compatible mix though since even if 5+ barbs are added to keep them well behaved and not nippy, I think they might dominate at feeding time due to being more able-bodied and they might starve out the goldfish. Thoughts? The other option I have in mind is to set up better filtering in the backyard pond and to put some back out there. A lone stray barb fry survived 2 weeks out there during the hottest part of summer, he was too good at hiding and got left behind when I brought the others that had hatched out there inside, so I think the pond does get enough shade to keep the temperature down. Winters here are mild too. cause skinniness. I've treated them with Praziquantel so far just in case they were skinny due to worms. with anything beyond a little bit of salt for now and I'm just hoping after another week or two in quarantine nothing will have worsened and I can get them into the bigger tank. Anyway I just don't have the experience to tell whether these white mouthed fish are injured or diseased or both. Hope you can help. I did end up getting a RO/filter system which has a mixer tap and a TDS inline meter allowing adjustment for both drinking water and aquarium water. I still don't quite have my head around converting TDS ppm to general hardness degrees - I did read somewhere that dividing ppm by 10 will loosely approximate French degrees but then I don't know whether French or German degrees are more commonly used. I haven't had any further shrimp deaths due to failed moults since I've started using 50-70ppm water for my shrimp tank so it's definitely helping. I'm wondering whether I should still be letting my RO-mix change water stand before I use it; I haven't been, because I thought that it was only necessary to allow time for water treatment chemicals to do their work but is letting water stand useful for other reasons? I have a 20lt plastic jerry can which I store the water in, this doesn't allow much exposure to atmosphere so should this water be agitated? Or just tipped into buckets? barbs, and I think it would be easier to manage water softness and ph if I start again and do things differently in a new tank. Thank you for your replies Bob and Neale. My heart says that I should move the head and tail light tetras into the main tank to give them space and stop them from squabbling or bumping into things, but my head says to give them another week of quarantine to see how their mouth lesions develop. don't really want to give infection a chance to set in again, but I am mindful also that these are different fish, from a different supplier, in a different tank, with different looking lesions that are in a different location on the fish, so I shouldn't expect a similar outcome to last time! I want to wait a bit longer and observe them tomorrow with the same bright light so that I can get a real idea if there is any progression. I do have tetracycline (Bio-tet) or Metronidazole (generic looking yellow tablets) available now for if the lesions worsen, although I'm not sure if I want to treat all the fish, or only the ones that are showing visible lesions. <I do think these mouth lesions are either plain vanilla dead tissue from fighting or crashes into solid objects, or else incipient Columnaris. Whiteworms in it as well as the big pink compost worms so I want to set up a new clean worm culture for some tasty occasional snacks for the fish, which I hope the tetras will like. 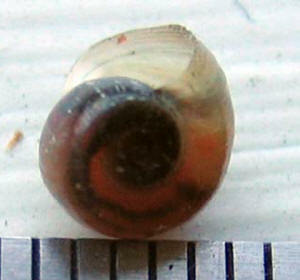 Speaking of which, the other fish haven't been eating my Ramshorn snails at all! I found three snails fatally jammed in the filter inlet grille today. go back to ripping at the plants. I've adjusted the sponge that I put over the grille so that only the most suicidal snails will be able to force their way in there, and I will just have to remember to rinse the debris out more often. I've decided that it will probably be more humane to leave the fancy goldfish in peace in the aquarium at work and to get a nice pond filter going to allow rehoming the excess rosy barbs outside, I probably wouldn't be able to provide adequate supervision to stop any possible mayhem that could occur with the work goldfish. It does get a smidge under 15 deg C here over winter, but the pond should get winter sun. If I can't work something out using either a solar pond cover or something similar to harness solar warmth, I can always bring everyone back inside in a temporary plastic crate for the coldest months. Thanks again for helping me sort through these problems! I chose not to quarantine them. I know I should have, but I have never had any problem with the tetras from this source. A bad decision on my part, but anyway, may I explain the problem to you...? fin meets their body. It's very clearly delineated and easy to see against their red-orange background. Soon after that, the dorsal fin degenerates and the fish seems to die within a day or two after they reach that stage. planning on giving them the entire course of treatment as directed by the manufacturer. Do you think that I am on the right track here? Please advise and thank you so much for your time and any comments you may have for me. Greetings. Well, I treated the entire aquarium with API Triple Sulfa for four days and then observed the aquarium for several days and the mysterious problem of the bacterial infection with the Serpae Tetras seems to have been eradicated. All the fish look very healthy. stated, can give it back to them even better than the Serpaes can dish it out. I haven't seen them bothering the gold gouramis, who can be rather pugnacious also if they choose to do so. but the guy at PetSmart said that the others that came in in that particular group had to be treated with antibiotics as well. Anyway, just to let you know what the outcome was with this incident. Thanks for the heads-up on Serpae aggression. I did notice that they are on nippy fish.net where they seem to be known as the culprit in many a fin-nipping incident. <Indeed. Excellent fish in terms of colour, size, and usually hardiness. You may remember me writing in a short time ago seeing advice on how to care for wild-caught Jellybean Tetra (Ladigesia roloffi). I've had them (they're lovely) since Friday the 13th (O.o), and thus far things have been going well - I thought - unfortunately, this morning I noticed a cottony growth by the gill of one of them. I didn't want to stress them further, but felt it was important to show you what I see, so I'm attaching 3 images of the same fish, in the hopes that it will help you help me! These two are among the smallest in a shoal of 20 - only about 1/2 inch long, if that. 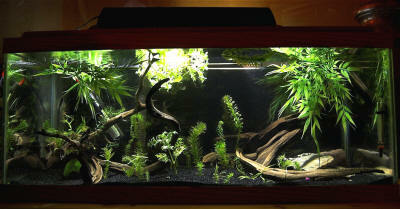 This is a 20g long QT tank that I set up just for them. There are more floaters now than there was when this image was taken (the day before they arrived). Most of the plants are real, except for the 'bamboo' floating - I didn't have enough floaters to provide adequate coverage, so I added some plastic ones in the hopes of easing any stress on the fish. Everything in this tank except the wood and plastic was taken from my original QT/plant grow-out tank, which was only a 10g. I didn't want to risk any fluctuation in the parameters, so moved everything over, including the substrate, plants, and filter. Also put in a 20g filter that has been on another tank for quite some time to ensure as stable of an environment for them, considering the new set up. I've been trying to keep the temp low - I've read that 77 is their optimum temperature, with 79 being the max. I can't keep the tank under 78-79ish - it's just where my room temperature gets the water. I've been testing the water daily, and have seen no fluctuation in parameters since adding these fish. They are under a 10g hood lamp, which I've slowly been increasing in duration to reach 8 hours, with the intent of slowly switching to the standard size hood lamp for this tank. The idea is to slowly get them used to conditions in my 29g community, which is where I hope they'll go eventually. I've been doing a small water change and siphon the sand every 2-3 days. and it's been a learning period for all of us. I've been feeding them lightly every day (I think - it's hard to tell because they're so small and so MANY of them - I'm new at this! ), and have been skipping every 3rd day. At first, they stayed on the opposite side of the tank as I siphoned (very gently and slowly, so as not to disturb them), but now they seem to have gotten used to it, and confuse it with the syringe that I feed them with and TRY to get to the siphon - so I kind of don't think I'm stressing them out with water changes, though I could be wrong. I've actually never dealt with any type of fungus (if that's even what this is) in my tank(s) before, and am especially leery as they're very small and wild-caught. I sincerely appreciate any information and insight you can offer me in order to get my tank healthy again, and my little Jellybeans safely through this! Let me know if there is any other information that might help. . . thank you very much! 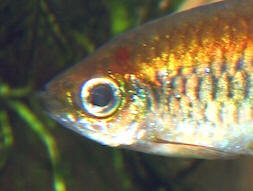 My Congo Tetra has a red spot on his head, right at the top of the gill. Pictures are worth a thousand words so check out the attached pictures. You can find the full size images at. You really need to look at the full size images, the images I attached don't have all the detail you need. I figured you didn't want me sending multi-megabyte pictures. Oh boy, this history on this fish is too long. He has survived cotton mouth and various other ailments in his 4 year life. Some of our other fish were not so lucky with the cotton mouth. We found some red spots on our Congo Tetras shortly after the cotton mouth cleared up. It killed our other Congo Tetra. It spent over 2 weeks in a 10g quarantine tank before it got better. We tried Maracyn, parasite killer and some food laced with antibiotics (I can't remember the names of the treatments). That was about 3 months ago. Since then the tank has been stable and no problems. Yesterday we found the spot. Any ideas? I am hesitant to move him to the quarantine tank, he just darts around and beats himself up on the glass and we don't want to get a bigger QT tank right now. He is exhibiting no odd behaviors, his eating and activity are normal. The other fish don't have any signs of damage. We have just used some Melafix in the tank, our Yellow Spiny Eel dug himself into a hole and lost some skin, used the Melafix as preventative measure. The eel was 100% better after only a few days. What the heck do we have, and don't tell me a tank full of fish:) And what do we do about it. Levels are good. Nitrate 0, Nitrite 0, Ammonia 0, Phosphate trace. 2 cubes of blood worms every night. There are no leftovers. Thanks for any, and all help.